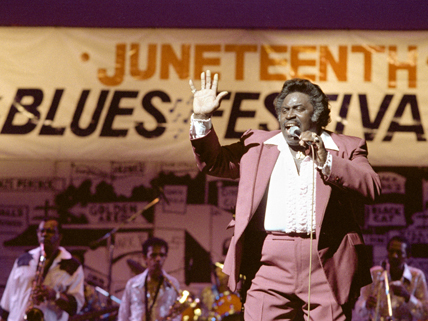 This Juneteenth blues festival was held in Houston, Texas. You have learned in your American history classes that Abraham Lincoln freed the slaves, right? Yes and no. On January 1, 1863, the Emancipation Proclamation freed all slaves in areas still in rebellion against the United States during the Civil War. For millions of enslaved people, though, freedom did not come until the war’s end in April 1865, when the Emancipation Proclamation was enforced throughout the rest of the South. In Texas, however, some 250,000 slaves had to wait even longer. The news didn’t reach Texas until federal troops arrived in Galveston on June 19 to enforce emancipation. From there, the good news spread gradually from plantation to plantation, and June 19 became a day to celebrate freedom. The festivities marking June 19—soon called Juneteenth—often began with the singing of the hymn “Lift Every Voice.” Picnics, family reunions, parades, pageants, barbecues, and ball games have all contributed to the excitement. Blues festivals added musical accompaniment for the day. White Americans did not necessarily applaud the merrymaking, though; many early Juneteenth events were pushed to the edge of town. Over time, some black groups raised money to buy land where they could hold their gatherings, including Juneteenth events. During the 1960s, the civil rights movement diverted interest from Juneteenth. By the 1970s, however, interest in the holiday revived. Today, Juneteenth celebrations continue to commemorate freedom, African American history, and the importance of education and achievement. Events include people of all races and have spread from Texas to other states. In fact, all but eight U.S. states have recognized Juneteenth through legislative action. Juneteenth has even spread to other countries. South Korea, Nigeria, Afghanistan, and Japan are a few of the countries where Juneteenth festivals have been held. Read about the events of June 19, 1865,and present-day celebrations. Follow the links to learn about one community’s Juneteenth celebration. Go to this website for all you could possibly want to know about Juneteenth. There’s even an online store for Juneteenth merchandise. Slave Ship Found in Alabama Delta?